Trevor Brander (above), Tolko’s regional control systems specialist, says their new Autolog machine-based grading system in High Level has helped the sawmill increase the number of grades it can capture from its planer mill. The grading of lumber by machine is one of those significant advances in lumber production that is changing the way forest companies market their products. But it’s something many companies don’t readily talk about despite its advantages, because replacing human beings with machines is unpopular. Yet industry can’t ignore the benefits. For the past decade, a number of technology companies and forest research organizations like FPInnovations have invested millions of dollars in advancing lumber grading by machine technology. They recognized the potential as computer vision technology and computer power advanced closer and closer toward meeting and exceeding the ability of human graders to recognize both the dimensional and visual attributes on each piece of lumber at high speed. In addition to revamping its planer mill, Tolko High Level also optimized its trim line in the sawmill. The sawmill produces SPF lumber in dimensions from 2 X 4 to 2 X 12 up to 20’. The potential advantages were obvious. As long as computer-based grading machines are set to operate within certain parameters, and are monitored and checked regularly, they can operate dependably 24/7. However, the challenge was designing a system that could recognize all the defects required by a sawmill with a high degree of accuracy at high speeds, especially in areas like the B.C. Interior, which is dealing with a highly variable wood supply due to the mountain pine beetle infestation. Until recently, limitations in vision technology and computer processing speeds still meant there was a place for human graders in many sawmills. However, a recent equipment installation at the Tolko sawmill in High Level, Alberta has proven that a completely computer-based grading machine in the planer mill can now meet and exceed the performance of human graders. It has installed Autolog Inc’s ProGrader linear planer mill optimizer and reassigned most of its human lumber graders to jobs elsewhere in the mill. The sawmill produces SPF lumber in dimensions from 2 X 4 to 2 X 12 up to 20’. Given the mill’s remote location and higher staff turnover, the opportunity to replace staff positions with machines was attractive. The sawmill has also started benefiting from the higher grade recovery that the computer-based system is able to provide. Gabriel Payant has been Autolog Inc.’s sales manager for the past 11 years and has a keen understanding of what a computer-based grading system can accomplish versus human graders. Trevor Bander, Tolko regional control systems specialist, says the company is taking full advantage of that expanded sorting capability. The Tolko High Level capital project completed last winter consisted of a total redesign of their planer mill. It has two lines. The existing older Autolog 3-D planer optimizer system was transferred to the second line and the new computer-based planer optimizer was installed on the first line. The project included installation of the Autolog Prograder and new Allen-Bradley control systems also supplied by Autolog. Mechanical installation was performed by Norjay Industries and electrical installation performed by Summit Electric. Some bridge roll cases, supplied by Prince George-based Wolftek Industries, were also installed to move the new optimizer 20 feet downstream from the planer, rather than being close coupled as was the case with the old set up. The roll cases also tie in lumber flow to the planer mill’s Machine Stress Rated (MSR) equipment. Tolko also decided to install two new Autolog 45 degree trimmer optimizer systems with Hermary Opto Electronics scanning heads capable of scanning every quarter inch on their green line, as well as two USNR multi-track fences. The trimmer optimizer measures lumber dimensions and trims for maximum potential value and recovery. Eventually, Tolko hopes to install computer software being developed by Autolog that will allow the trimmer optimizer to communicate with the planer optimizer to coordinate processes and parameters so that the sawmill can capture even more value. Further downstream from the planer mill, Tolko has also installed Z-Tec Automation Systems ink jet printers as part of this project. The installation of the entire project took about 10 days. Payant has witnessed many of the technological leaps achieved by manufacturers in computer-based lumber grading technology. He says Tolko High Level purchased the second 3-D lumber grader produced by the company five years ago. 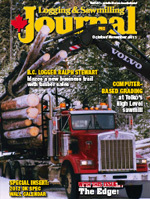 Autolog has installed four more of its computer-based grading systems for other major lumber producers with planer mills in Alberta and B.C. Two locations are in the heart of the area most devastated by the pine beetle. Payant says it is the computer-based system’s ability to be able to scan and categorize lumber into many more grades than human graders that has really proven the technology’s worth—particularly in the beetle-ravaged B.C. Interior. That ability is particularly important for companies processing high volumes of beetle-infected logs because of the amount of checks in the wood. To ensure that the machine-based system would suit its needs, Tolko personnel spent a week testing various lumber samples from the High Level sawmill at Autolog’s laboratory to ensure that the machine-based system could detect to the level of accuracy at production speeds that they required. The exercise was useful for Autolog as well, as they were able to tweak and improve their system according to Tolko’s requirements. The Tolko installation shows just how far the technology has advanced in just five years. Autolog’s new computer-based planer optimizer system has three different sensors. The first are 3-D sensors that measure width, thickness, length, wane, twist, crook and bow on a scale that is three times more accurate than the system produced five years ago. That system scanned every half inch. This new system scans every quarter inch. It also consists of high resolution color sensors that detect all visual defects. Finally, it has tracheid sensors that detect slope of grain and low contrast knots. “With all these sensors working together, we can remove all human decisions,” Payant says. He adds that with a system costing in the neighborhood of $1 million, it would only take a sawmill six months for the system to pay for itself because of faster lumber throughput, capturing more value, and the opportunity to reduce payroll. 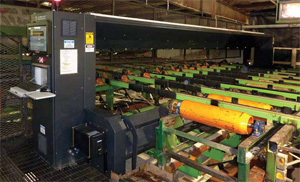 Sawmills are able to customize the settings on the computer-based grading systems to meet their specific needs. In addition to having to prove that a machine-based system could match and surpass the abilities of human graders, equipment suppliers also had to develop systems that performed with a very high degree of accuracy just as planer mills with higher throughput capabilities were arriving on the market. 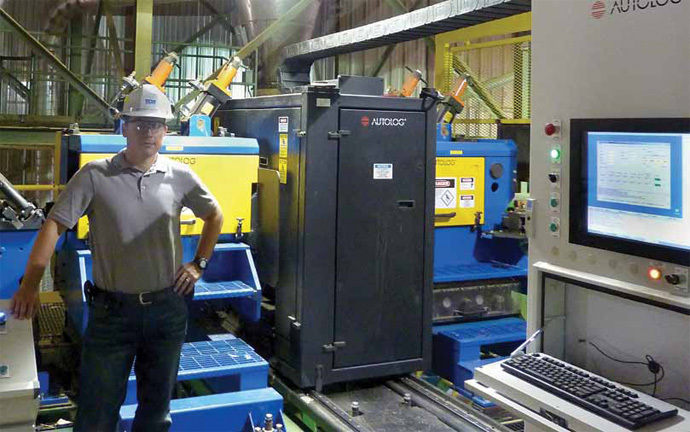 Payant says when machine-based grading systems first started arriving on the scene, planer mill throughput was in the range of 1500 to 1800 feet per minute. Now, sawmills commonly push lumber through at speeds in access of 3000 feet per minute. Because the new system had the same footprint as the old system, Autolog technicians were able to drop the new system into place at the Tolko sawmill quite easily, and to smooth the transition to the new system, they initially set the new computer-based grader to operate just like the old system. The new visual defect detection systems were slowly and successfully brought on line and the system began operating to its full capability as a totally, machine-based lumber grading system within two months. Brander says the primary reason why Autolog was chosen as their supplier was the mutually beneficial partnership agreement, technology and level of after-sales support they offered for the equipment, which was critical given the sawmill’s location.